Have you always loved the ocean? The creatures underneath? You're probably one of those whose idea of a good time is floating weightlessly amongst the dolphins and rays and turtles and of course, the fish. That need not be a dream all your life. You can make it happen. First off, find a local dive center and tell them you want to join a scuba diving course. There will usually be a home study portion, so get started with it. Sometimes, it comes as a paper manual. Other times, you can access it online. You need to know all the basics of scuba diving before you start your first underwater adventure. Of course, you will have a scuba instructor, and he will expect you to ask a few questions on parts of the written course that you may have doubts about. You may have something in mind which is related to the course, but is not included in the materials. Visit us at scubaguru.org for more info. After this, you will be trained in-water by your instructor, but not in the ocean right away. You'll probably be doing this in a swimming pool or any designated confined space with water. This is where you will be taught basic skills and knowledge about scuba diving. You learn how to set up and use your equipment, swim properly with your scuba, clear your regulator and mask, ascend and descend, manage emergency procedures, and all the rest. For more info, click here. The last step is open water testing of your scuba skills. This is where you will finally apply everything you have learned in a real-world open water scenario. This usually includes at least four open water dives, during which you show will your instructor your ability to plan and manage a dive. Either these "check-off" dives are done locally or in during your vacation in some tropical destination. As you can see, you will be spending quite some time with your scuba diving instructor. And there will be lots of learning to do, especially if you've never done scuba diving before. This is why you have to be careful in choosing which dive center and instructor to train with. Qualifications are important. You have to pick people who really know what they're doing, professionally speaking. On top of that, you should find an instructor who has good chemistry with you. You should be able to trust this person completely so you can maximize your learning. 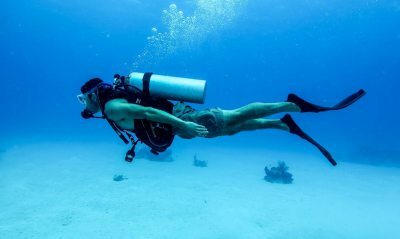 You can also learn how to become a scuba diver by checking out the post at http://www.huffingtonpost.com/the-active-times/the-most-dangerous-scuba-_b_6699562.html.